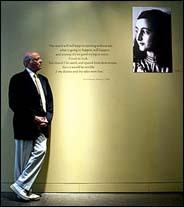 Bernd Elias, first cousin of Anne Frank, at a new exhibition about her and her writing at the United States Holocaust Memorial Museum. ASHINGTON, June 11 — Since it opened in 1993, the United States Holocaust Memorial Museum here has tiptoed around the legacy of Anne Frank. What more could be said about this most famous victim of the Holocaust, a 15-year-old girl whose diary is the only book many people will ever read about the murder of six million Jews (and millions of others) during World War II? Until now, the museum's answer was to devote a small corner panel to her — a tiny part of three floors of exhibits. That, to the museum, seemed enough. But not to the public. Sara Bloomfield, the director of the museum, said the two questions most often asked at the information desk have been, Where are the bathrooms? and, Where is the Anne Frank room? So Ms. Bloomfield is giving the public what it apparently wants, mounting an Anne Frank exhibition for the museum's 10th anniversary. It puts on display writings never before shown in the United States, some never before shown publicly anywhere. Laura Bush will open the exhibition on Thursday alongside Bernd Elias, a first cousin and close friend of Frank. Ms. Bloomfield and her co-curator, Klaus Müller, are presenting Frank in a way the public is not accustomed to seeing her — not merely as a victim who kept a vivid record while hidden in an Amsterdam attic, but as a young woman who was determined to train herself as a professional writer and who carefully edited her diaries for publication. In the process, the curators have managed to explain a mystery that has perplexed journalists, historians and writers for the past 50 years: why, after the mass murders and genocides of the 20th century in Cambodia, Bosnia, Rwanda, Kosovo and Congo, has there been only one Anne Frank, only one voice that has broken through the horrors and captured readers' imaginations generation after generation? Survivor memoirs seldom have the immediacy of writing that was done during the travails. And while other young women and men have left behind diaries and letters from Sarajevo or Phnom Penh, none have captured the public imagination. The show provides perhaps the most obvious answer as to why Frank's work has endured: she was a prodigiously talented writer who took one of the oldest forms of writing and pushed its boundaries, keeping an exquisite record not only of her days in confinement but also of how she imagined the world and her future role in it, even as the world was being denied to her. "People don't read these diaries simply because an innocent girl penned her thoughts while hiding from the Nazis," Mr. Müller said. "There are hundreds of other diaries from the same period, but only Anne Frank carefully crafted her writing, using the short time she had and her extraordinary energy to produce one of the best-selling nonfiction books in history." Determined to spotlight the serious writer, the two curators spent months pleading with Mr. Elias, the president of the Anne Frank-Fonds, or foundation, in Basel, Switzerland, which holds the copyright on Frank's works, and with officials at the Netherlands Institute for War Documentation in Amsterdam, which holds the original manuscripts. They eventually won permission to bring together in Washington examples of all her writing, most of which had never left the Netherlands. Some have never been seen in public. "At first I said no, no, no," Mr. Elias said in an interview at the museum. "An absolute 100 percent security doesn't exist, and I was afraid to give the Holocaust Museum anything that was original. What if we lost any of Anne's papers?" What changed his mind, he said, was the idea that if all of his cousin's writings were put together in one place, her image might change, and she would be seen as more human and more serious. "We had never been approached to show the originals," he said. "You'll see, she covered so many themes, from Judaism to the emancipation of women. The show goes deeper, and Anne comes closer. You see her thinking." Mr. Müller and Ms. Bloomfield won approval to display Frank's collection of essays and fiction, an accountant's ledger filled with favorite quotations titled "Book of Nice Sentences," and another 300 loose pages of writing that include editing of her diaries. Taken together with the books she studied, these compilations show her as a writer and thinker in training. They show how Frank edited her diary for publication after hearing a member of the Dutch government in exile ask in a radio broadcast for people to keep eyewitness accounts of their suffering under the Nazi occupation. "I looked into the bank vault where these books were kept and I said, `Oh, my God!' " Ms. Bloomfield said. "Everyone thinks they know Anne Frank — I thought I did — but I was so wrong." The essays, fairy tales and adventure stories pick up themes that Frank raised in her diary and then tried to expand in another form. The show has English translations of excerpts from "Eva's Dream" and the entire essay "Give!," an idealistic exhortation for greater equity in the world. More intriguing is the "Book of Nice Sentences," which shows her appreciation of the masters. She recorded her favorite quotations from Shakespeare, Goethe and John Galsworthy, nearly all in Dutch or German. Her one favorite sentence in English was from Oscar Wilde's "Ideal Husband." The ledger is open to that page and shows in Ms. Frank's handwriting the quotation: "Well, she wore far too much rouge last night, and not quite enough clothes. That is always a sign of despair in a woman." The entire collection of her writings was published for the first time this year in "The Diary of Anne Frank: The Revised Critical Edition" (Doubleday). "Anne used the format of the autobiography with invention and then rewrote and rewrote, six pages of her diary every day, while she was also reading, studying and creating new stories," Mr. Müller said. "Authorship is not a compensation for a life she never had. Authorship is what she earned."